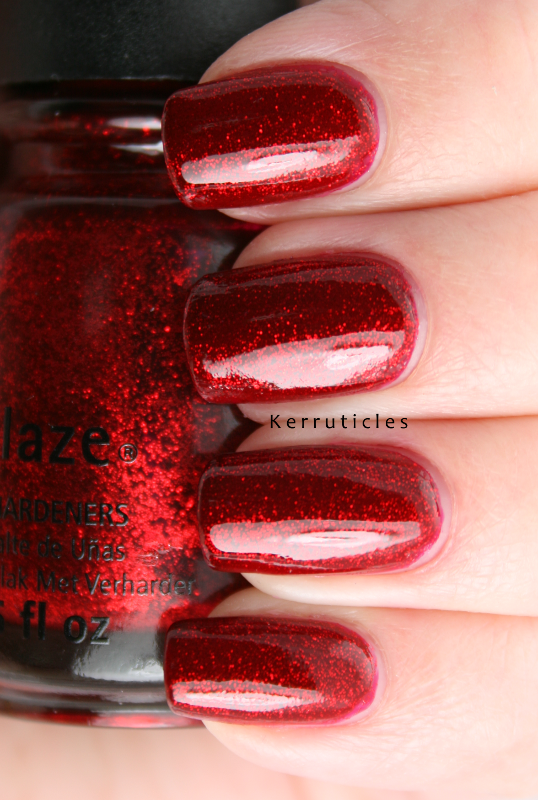 My one true red, glass-flecked polish love was always Essie Leading Lady. I adore it on my nails, but the application difficulties I had with it left me so disappointed. So I went out and bought Ruby Pumps in the hope that it might fill the gap in my heart! I love it. It’s so easy to apply (certainly in comparison to the cow that is Leading Lady). And I’ve heard that it’s a dream to remove too, so that’s an added bonus. Ruby Pumps is a crimson red with sparkly red glass flecks within it. It really captures the essence of Dorothy’s ruby slippers in the Wizard of Oz. It looks great in sunlight or where there are overhead lights. Sadly, it’s overcast and raining (and far too cold for May) in London today, so I haven’t chosen a very good day to wear it!